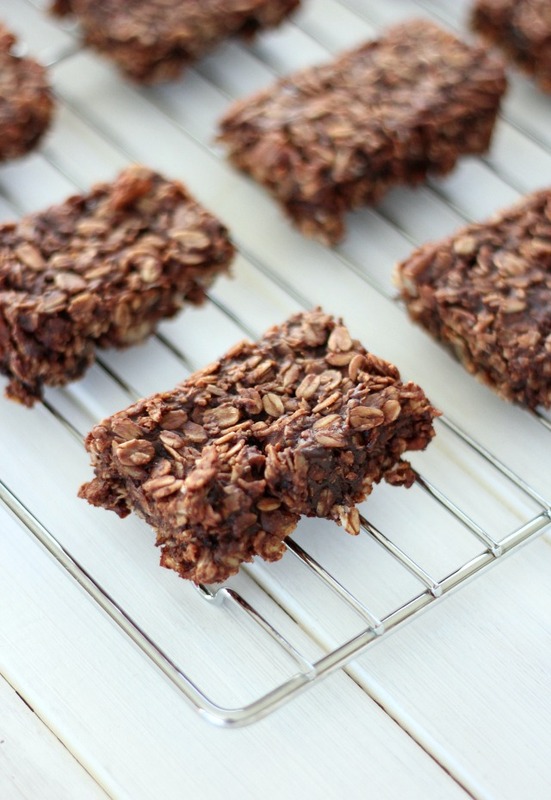 Gluten-free chocolate oat breakfast bars are perfect for busy mornings or after-school snacks. Simply make ahead and pop in the freezer. Although I try to eat healthy most of the time, the holiday season has a way of turning those good intentions upside down. It starts with one shortbread cookie, then a tiny piece of fudge, and the next thing I know, I’m eating handfuls of caramel popcorn. Oops! Now that it’s January, I’ve hit the reset button and I’m on a mission to clean things up. One has to be sensible about these kinds of things, though. We lead busy lives that often require running out the door with coffee in hand along with a store-bought granola bar to eat along the way. Did you know those things are often packed full of refined sugar and ingredients I can barely pronounce? Yikes! I work from home, so my morning routine allows for healthy things like green smoothies or steel cut oats or quinoa breakfast pudding. But, for many, that simply isn’t the case. For people like my husband who commute into the city everyday for work, mornings are rushed. That’s when homemade chocolate breakfast bars are there to save the day. It makes it so much easier to back away from the lunch room cookies and donuts if you know what I mean. Thank you, thank you, thank you!! 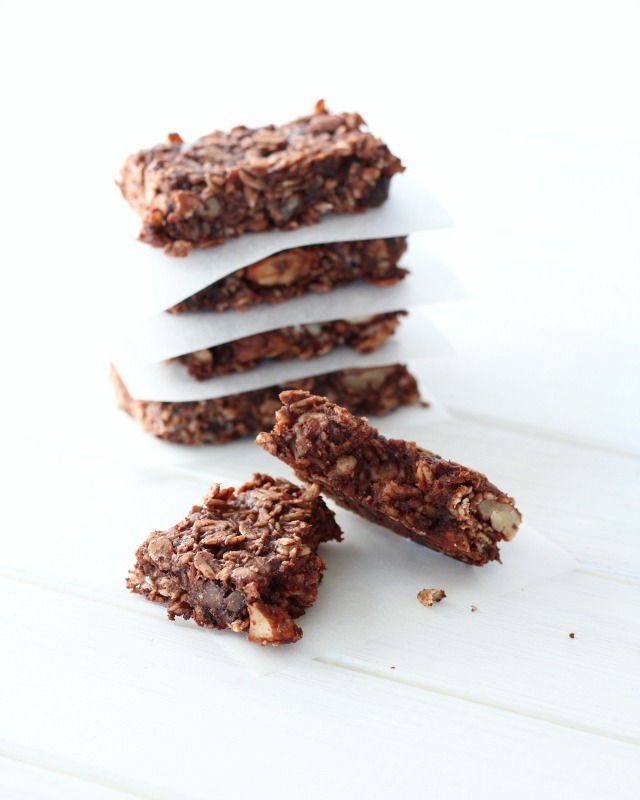 And with simple ingredients like wholesome rolled oats, hearty nuts, dark cocoa, coconut and nut butter sweetened with a bit of honey and maple syrup, you really can’t go wrong. Not only are they satisfying in taste, they’ll fill you up! Don’t limit these gluten-free oat bars to the morning only. They’re also a perfect on-the-go, energy-packed snack to get your kids through their after-school activities or to munch on during homework time. Their rich and fudgy goodness will satisfy their sweet tooth too. Maybe even have one for dessert. Make a batch ahead of time, pop them into the freezer, and you’ll be ready anytime hunger strikes! 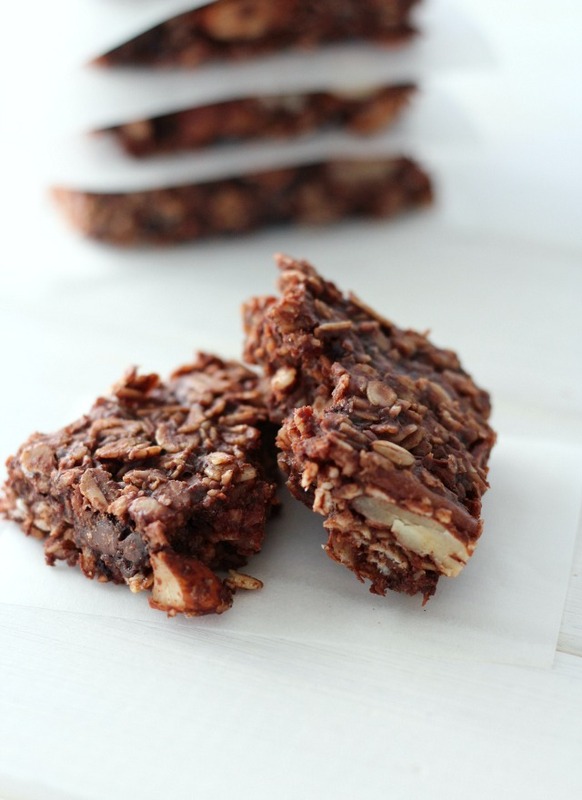 Chocolate Oat Breakfast Bars are Seriously Good! 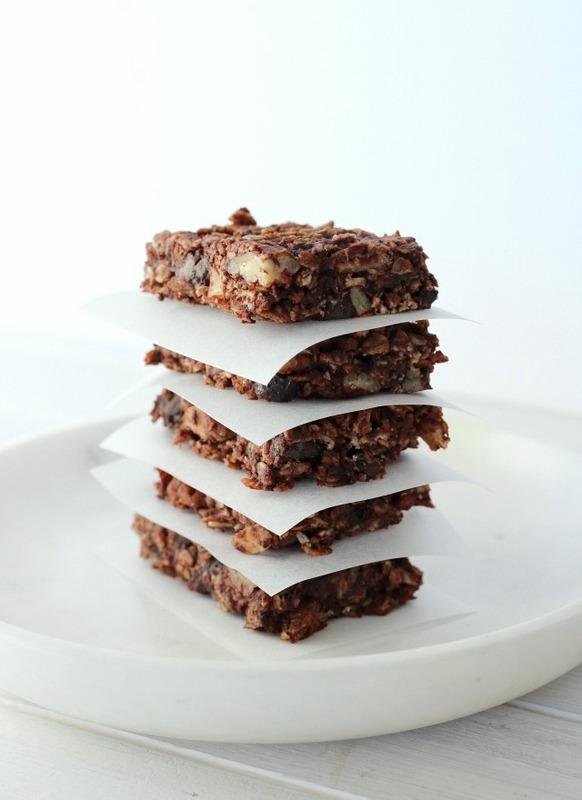 So, how do you make healthy breakfast bars? They’re easier than you may think. Give them a try! 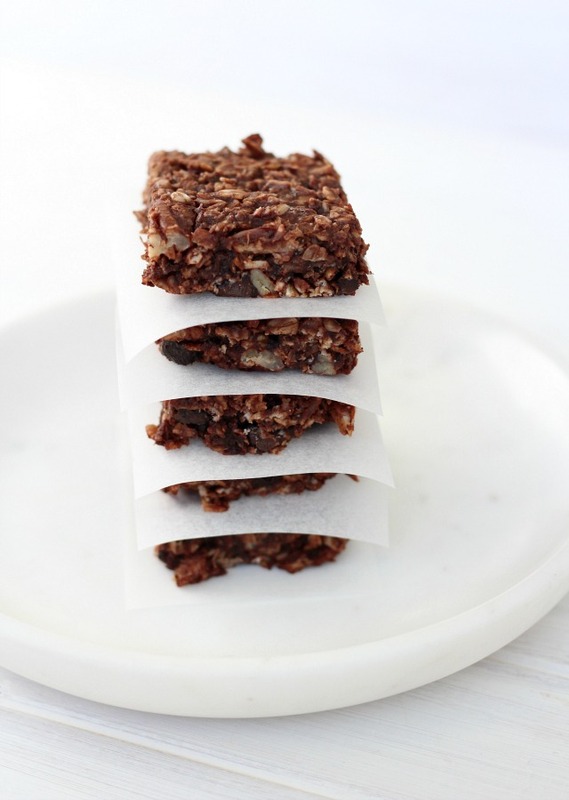 These gluten-free breakfast bars are perfect for busy mornings or after-school snacks. Wholesome, filling and delicious! Preheat oven to 350°F. Grease a 9 x 13 baking dish. Add rolled oats and water to a large mixing bowl. Stir until well combined and set aside for 5 minutes. Add coconut, almonds, pecans and chocolate chips. Mix and set aside. In a medium saucepan over low heat, melt honey, nut butter and coconut oil. Add almond milk, cocoa powder and maple syrup and mix until completely dissolved. Remove from heat and stir in vanilla. Pour over oat mixture and mix thoroughly. Press into baking dish using a spatula or slightly wet hands. Bake for 15 minutes. Remove from oven and let cool slightly. Cut into 18 even-sized bars. Transfer to a parchment lined baking sheet and return to oven for another 10-12 minutes (until the edges are dry to the touch and golden brown). Allow to cool for a few minutes, then transfer to a cooling rack. Store in an airtight container for up to a week or pop into the freezer. Gluten-free rolled oats are labelled as such. I used Bob's Red Mill brand. If gluten isn't a concern, you can use any whole grain rolled oats. Some dark chocolate chips contain milk or milk ingredients. Be sure to read the label if dairy is a concern. Prefer energy bites? Click here to try this chocolate chip peanut butter recipe. They’re so delicious! Or, maybe you’d enjoy these blueberry oat breakfast muffins. 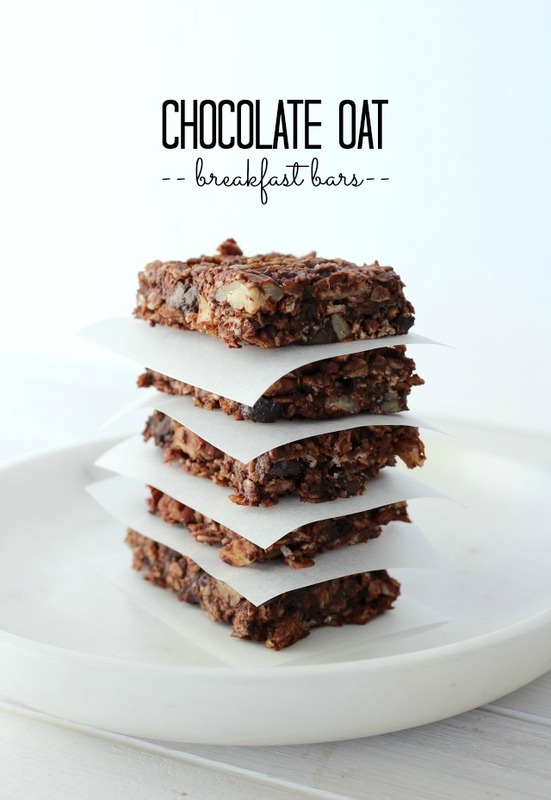 This chocolate oat breakfast bar recipe was originally posted January 2017. They look pretty and delicious! I work from home too so even for me it’s easy to make a healthy choice, but these will be perfect to hand out to my husband on his way to work! Thanks for sharing, going to make some ;-) ! Hey Shauna! I know exactly what you mean! The holidays was a complete gong show. There may or may not have been a day where I ate Christmas cookies exclusively. Trust me, I felt the regret the next day. These bars look like a great snack to get me back on track. Thanks for sharing! OH and I love your pictures! Any idea how many calories there are ? Hi Amanda, It depends on the kinds of nuts and nut/seed butter you use, but they’re around 250 calories if you divide the recipe into 18 bars.